After being released on January 13th, then pulled from Xbox Live, the first post-launch DLC for Dragon Age is set to be released next week. Return to Ostagar has been plagued with problems. First, it was supposed to come out on January 5th, but it didn't. Then it mysteriously popped up on Xbox Live on January 13th, with much hubbub, and then just as inexplicably disappeared. Later, BioWare admitted that the problem was on their end, and that they were working "around the clock" to get it fixed. 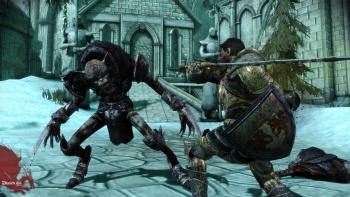 Now, BioWare founder Ray Muzyka has said that Return to Ostagar should come in the "next week or so." "We have a big investment planned for Dragon Age with more DLC coming in the next week or so," Muzyka said in an interview with PCGZine. Why was the release of the DLC such a problem? "I don't know if it was a communication error with our distribution partners or what happened there," Muzyka said. "If they were released in order it would have been fine, but it created a bug which prevented progression, and obviously that wasn't acceptable, so we pulled it down." Maybe BioWare should have launched with a "Denerim Network" front end interface to handle all of their downloadable content... Wait.